Happy Friday lovely readers!! 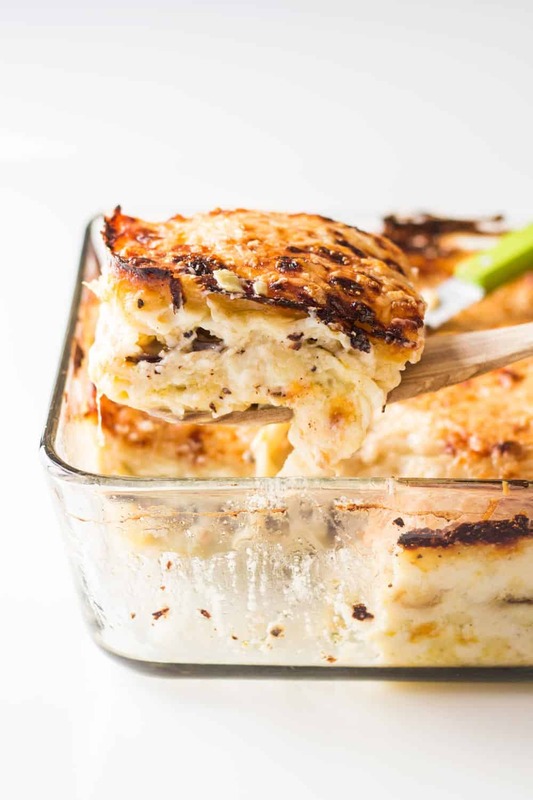 Let’s finish the week with an extraordinary Artichoke Mushroom Lasagna with creamy Bechamel Sauce. 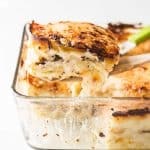 My mother used to make this artichoke mushroom lasagna a lot. Like a lot a lot! How couldn’t she? The lasagna is perfect for preparing ahead. I always choose my menu wisely for dinner parties for example in order to avoid stress. The more you can prepare ahead, the less stressed you will be the actual day. Stews or Roasts or Lasagnas are the absolute best dishes to share with others. These things take a little longer to prepare. However, you will be totally relaxed and your kitchen will be shining clean by the time your guest arrive. Usually I cook only 2-3 lasagna sheets at a time out of fear that otherwise they might stick together. This time I risked it and cooked 10 sheets at once. Turns out that if you keep moving them around they don’t stick!!! Wheeee! Separate the artichoke leaves carefully and spread them out in a thin layer. The lasagna will only be in the oven for 30 minutes so you can’t stack too many artichoke leaves on top of one another. They won’t cook through in the short baking time if you do. Go easy on the cheese, don’t use more than suggested in the recipe. There is cheese on every layer already and if you use too much, the lasagna becomes all greasy and falls apart. Remember, more does not always mean better. The right amount of every ingredient makes the difference between a good and an extraordinary artichoke mushroom lasagna. When spreading the bechamel sauce make sure you cover the edges and especially corners really well. Uncovered corners dry out in the oven. All lasagna sheets have to be properly covered with sauce to stay soft. To sauté the mushrooms the pan has to be SMOKING hot! If it isn’t hot enough, the mushrooms release a lot of water. Instead of sautéing you end up cooking them in their own juices and they will become extremely soggy. Yuck! You can also sauté them in two parts to make sure they turn out like in the photo above. Use a melty cheese like Swiss cheese, Cheddar cheese, Edamer or something along the lines for the middle layers. A cheese that really melts and gets al gooey and delicious. For the last top layer use only Parmesan cheese. 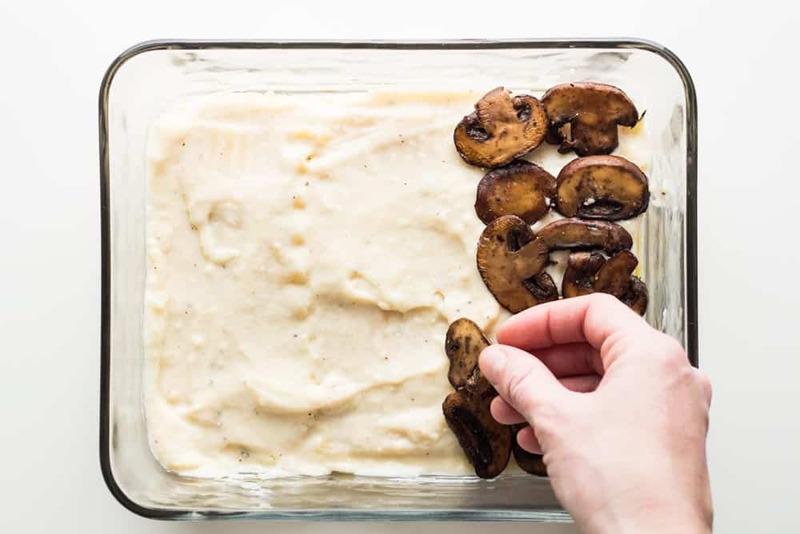 Parmesan gets a beautiful color when under the broiler for a couple of minutes and it gets crusty instead of melty and gooey which is exactly what you want for this artichoke mushroom lasagna. 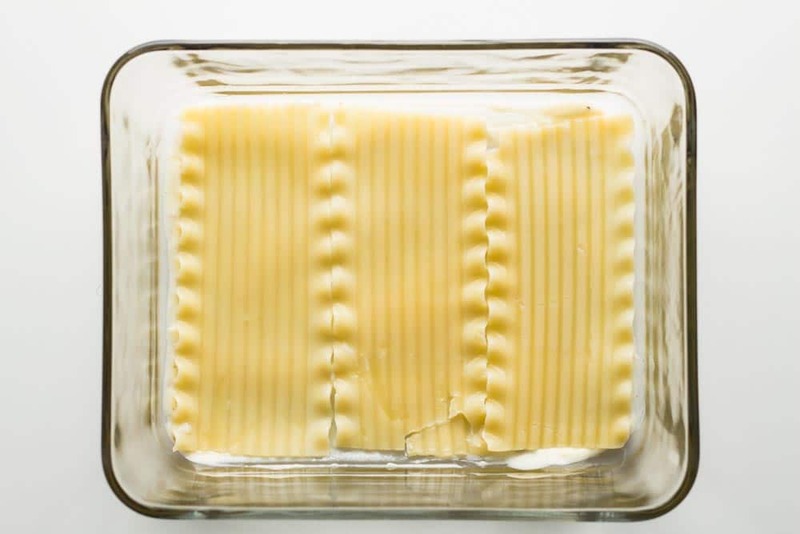 Let the lasagna cool down for at least 10 minutes before cutting. 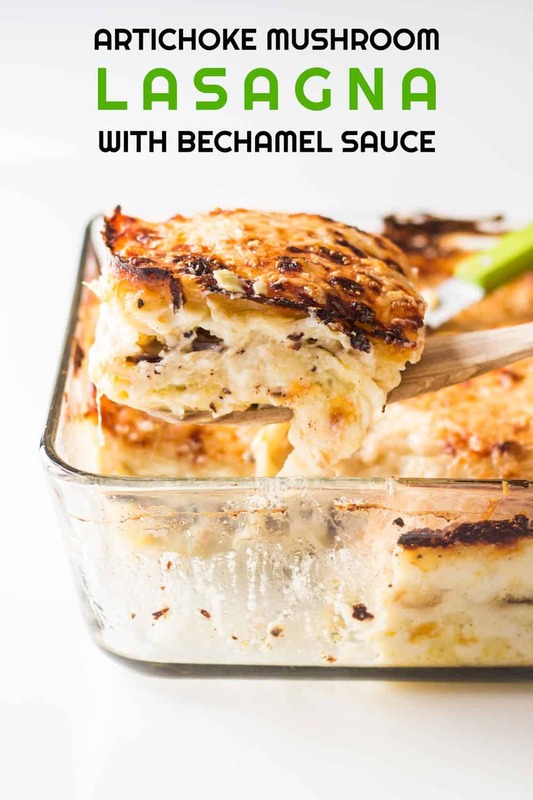 The bechamel sauce and cheese have to harden a little bit so the lasagna doesn’t fall apart. 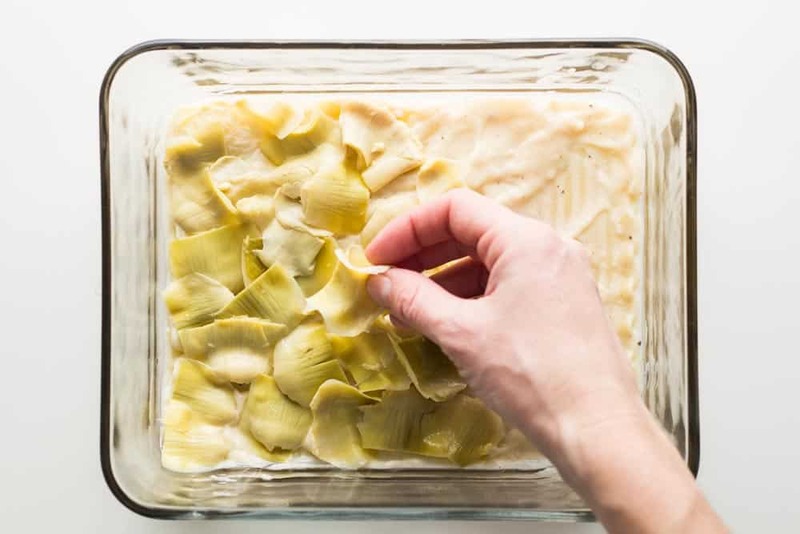 Use a sharp and pointy serrated knife and cut the artichoke mushroom lasagna into desired serving size, then use a flat spatula to lift out of the baking dish. Serve with fresh leafy salad and enjoy immediately. Bring abundant water to the boil in the biggest pot you own. In the meantime, if your mushrooms aren't already sliced, slice them now (not too thin). 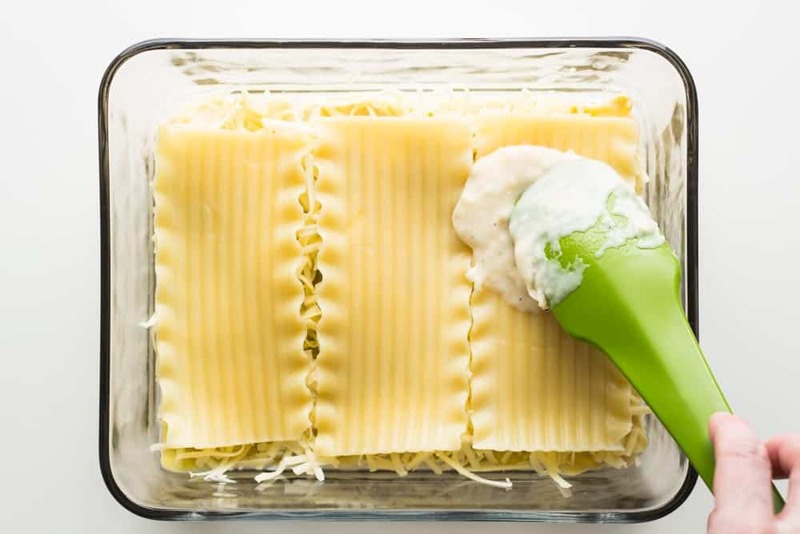 Cook lasagna sheets in boiling water until al dente, moving them around often with a fork or spoon to avoid from sticking together. 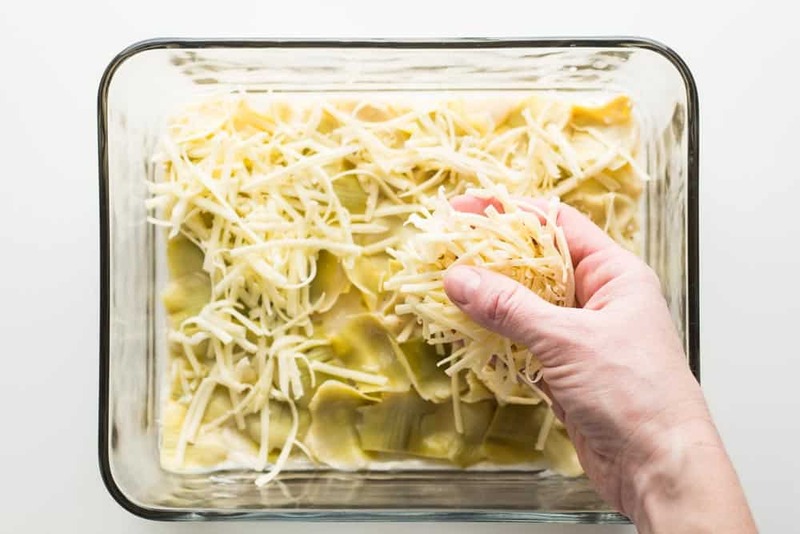 Once lasagna sheets are cooked, don't drain them in a colander but rather fish them out one by one and lay them out on non stick baking sheets or plates or even just on parchment paper laid out on your kitchen counter to avoid from having them stick together. In a another medium saucepan melt butter over medium low heat. Once melted add flour and whisk until all lumps are dissolved. Add 750 ml milk, 2 tsp salt, 1/8 tsp nutmeg and pepper to taste and stir, and stir some more and some more and some more. Do not stop stirring until the sauce has thickened to about yogurt consistency, then remove from heat and keep stirring until it cools down a little. Now the large pan should be smoking hot, add a splash of olive oil and then sliced mushrooms, a good amount of salt and pepper and move around quickly to avoid from burning and to ensure all the water evaporates quickly so the mushrooms don't become soggy. Now it's time to assemble the lasagna. First spread a very thin layer of bechamel sauce on the bottom and then lay out lasagna sheets to cover the whole bottom, cut the sheets accordingly to fit in. 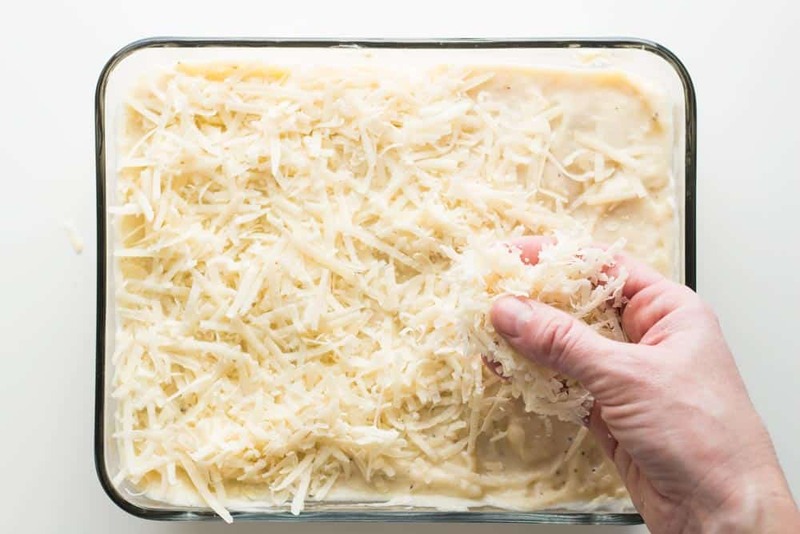 The first layer of bechamel is not for taste but to avoid the lasagna sheets from sticking to the bottom so it really only has to be very thin. Now spread a thicker layer of bechamel sauce on the lasagna sheets covering edges and corners really well, too. Lay out artichoke leaves in a single layer, then sprinkle a little bit of cheese on top. 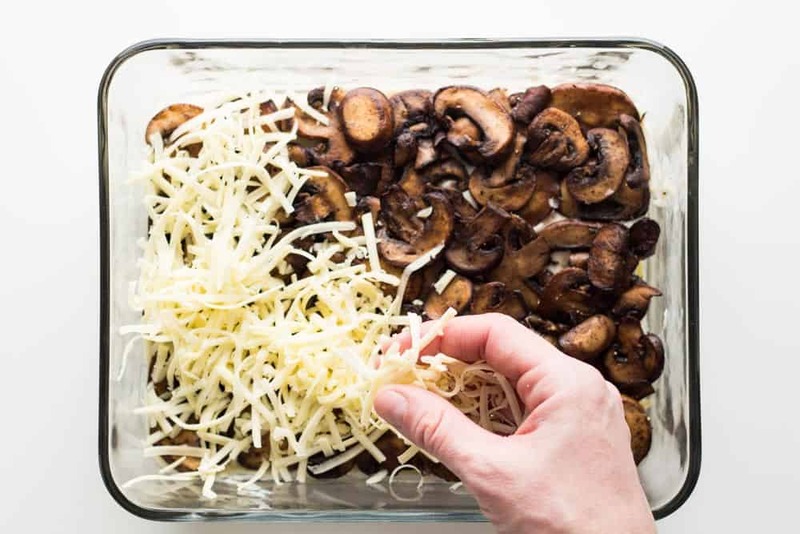 Now start your second row by laying out lasagna sheets, spreading bechamel sauce on them, placing sliced and sautéd mushrooms in one layer on top, sprinkling with cheese and top with lasagna sheets. Put in the oven for 30 minutes and finish off with 3-4 minutes under the broiler to get a dark and crispy top. Turned out awesome. I added a little bit of fontina and smoked Gouda to the sauce. I chopped up pancetta and onion and garlic sautéed that then the mushrooms. Then used a little mozzarella, Gouda and fontina cheese grated between each layer. It was so amazing. Thanks for the wonderful recipe. Hi Gina, thank you so much for coming back and commenting. You made my day!!! Your cheese choice sounds AMAZING!!! It was delicious and the only change I made was to chop the artichoke finely and I used garlic butter to do the mushrooms in. Thank you for sharing your incredible recipe! I would love to make this but I have never seen measurements like this is my life!!! Can you list proper imperial measurements please? What is 1/8 nutmeg? Why is flour listed in fl oz? Looking for A recipe that uses Cup, tbsp., etc., Thank you! Hi Colleen, the recipe has all imperial measurements. My recipe plugin has this extremely annoying drop down menu option to convert from metric to imperial and the other way around and it doesn’t work at all. I’ve tried to delete it but it keeps popping up again and again. You probably clicked on it by accident and it converted to metric and then you tried to convert back to imperial and it converted 1/3 cup flour into a fl oz measurement that doesn’t make any sense. I’m really sorry about that. When that happens, just refresh the page. I will look into deleting that drop down thing again though to avoid that from happening again. Thanks so much! Lol it is fine today when I checked! Also can I use canned artichoke hearts in water? I know they lack in flavour, but I was nervous to grab marinated ones. Excited to try this today! Thank you!!! I’m sure it’ll turn out just fine with canned artichoke :) Let me know how you liked it!! Que gusto que te haya servido esa receta, además es realmente delicious. Muchos besos y no me canso de felicitarte por el lindo trabajo que haces. Gracias por todos esos deliciosos platos que se quedaron grabados en mi cabeza para siempre!! !